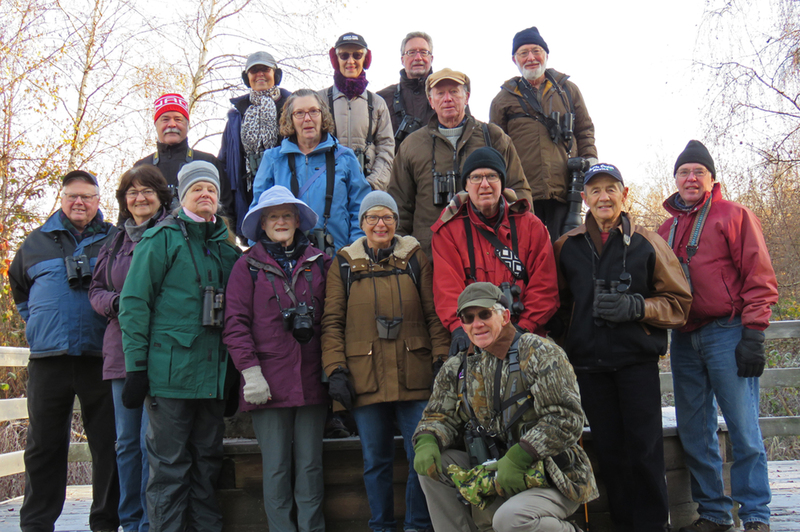 Some Delta Nats took part in the Ladner Christmas Bird Count on December 22. The cold windy weather resulted in a lower than usual count in nearly all the count areas. At least the rain held off. Counts are carried out within a 24-km diameter circle that stays the same from year to year. The Ladner Christmas Bird Count area includes Tsawwassen, Point Roberts and south Richmond. Ladner and Victoria compete for the most species in Canada – usually over 140. The Ladner count area is divided into 11 sub-areas. I went to the post-count gathering at Reifel. 4 of the 11 areas were not represented. The preliminary Ladner count without them was 128. Reports from feeders will be added later too. I will let you know when I hear the final tally. The Ladner total in 2017 was 139. Area I (Tsawwassen east of 56th) found 56 species. In 2017 we found 71 species. In 2016 we found 69 species. We did find the Ruff that has been around for the last few weeks. That was the only species that no other Ladner count group found. We did not find the Harris’s Sparrows, but some other groups did. We did not find the Red-breasted Sapsucker that had been in the same tree, near Boundary Bay School, the previous 2 years. Area K (Tsawwassen west of 56th) found 60 species. They found the 6 Snow Buntings on the ferry causeway. The Point Roberts group saw 91 species including Virginia Rail, Western Meadowlark, Red Crossbill and 266 Golden-crowned Kinglets. The area including the landfill had 1032 Bald Eagles. There are photos on the DNCB Flickr site. Don’t forget our first DNS Monthly Meeting of 2019, Wednesday Jan 2 at 7:30 pm, at Benediction Lutheran Church. 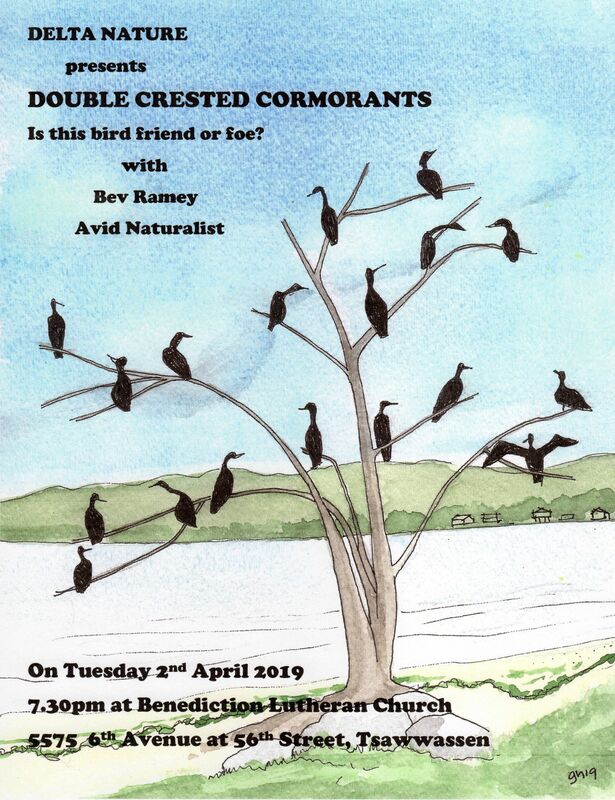 After the regular business is concluded, Paul and Carol Rennie will be our guest speakers, speaking about The Galapagos Islands and the Peruvian Amazon. Tuesday, 8 January 2019 will be the first DNCB Outing of 2019. We will meet near White Rock Pier (WR Pier broken, boats smashed etc. December 20th, 2018, see https://www.surreynowleader.com/news/white-rock-pier-damaged-by-storm/) and then bird at Blackie Spit. Watch this spot for more details! Our plan is still to leave Petra’s at 7:30 and arrive in White Rock about 8. Although the pier and east promenade are closed, we will park by the museum immediately west of the pier to see what we can see from shore. Then park again at the west end of the beach before the road goes uphill. Parking is free before 10am. Then we will go to Blackie Spit. We usually park at end of the road in the gravel area, and start by walking out on the spit. Fourteen brave souls endured a surprisingly dry and very birdy Tuesday morning along the Tsawwassen Ferry causeway and then at our “Mecca”, Reifel Bird Sanctuary. Check out/click on the photo evidence of some rare and gorgeous sightings on our DNCB Flickr site. Because of the rainy forecast, on Monday we changed Tuesday’s outing destination from Burnaby Mountain to local. When I arrived at Petra’s at 7:15 am, it was pouring rain. But when we left at 7:40 am, the rain had stopped and it never rained again until lunch time when we were in Speed’s Pub in Ladner. “Someone” is looking after us DNCBers. Our first stop was the pull-off along the Tsawwassen Ferry causeway. The tide was high, and we eventually found our “destination bird”, the Snow Bunting. We saw three, but Roger said there were six around earlier this week. Lots of other neat sightings in the Bay between the two terminals, including: Common Goldeneye, Common Loons, Bufflehead, flocks of Brant Geese, an uncommon Black Scoter among a raft of Western Grebes, a flock of Dunlin, Double-crested Cormorants, only a couple of Horned Grebes. The resident Black Oystercatchers and Black Turnstones were also up-close-and personal. On the south side of the causeway were various rafts of White-winged and Surf Scoters, and more Goldeneye. Interestingly, Terry took a Group Photo here, of ten of us squinting into the beautiful rising sun. We learned later that Margaretha had ridden her bike to see the Buntings, but we missed her. We left the causeway in a convoy of nine, yes 9 vehicles (brutal car-pooling), through the TFN and Ladner fields. The best sighting was a perched and posing Peregrine Falcon on a telephone pole just entering Westham Island. Several groups of Trumpeter Swans in various fields was nice too, and the Mute Swans were under the Westham Island Bridge. At Reifel we met the others and Glen took the Group Photo of the 13 (without him) by the George Reifel memorial stone. A wintering Black-crowned Night-Heron was sleeping in his customary trees. We had a very pleasant walk, chatty as always, along Reifel’s trails. Some of my special sightings included: the always brilliant Wood Ducks, Golden-crowned Kinglets, both Common and Hooded Mergansers in breeding plumage. Actually, most of the wintering ducks here were in beautiful breeding plumage, making them easier to identify too. The Black-capped Chickadees were voraciously hungry too, eating from our hands. Interestingly, later on the trail we ran into a large flock of Red-winged Blackbirds, almost all males, and they were ravenous too; see photo on Flickr of them eating from my hand and on my hat. In the ponds near the Tower were Northern Pintail, Northern Shovelers, Green-winged Teal, Gadwall, American Coots and, of course, Mallards and American Wigeon. A flock of Long-billed Dowitchers was resting in the next pond. Near the dowitchers, a Virginia Rail flitted across the water and hid in the reeds. Anne and others were patient and finally saw another, and deducted from sounds that there were three rails there. Over the marsh along the shore were thousands, yes thousands, of Lesser Snow Geese, occasionally rousted for a mass uprising by a passing Bald Eagle. A beautiful sight. Back on the inland trail, we saw several Ring-necked Ducks and a few Lesser Scaup, but were blanked on the Canvasback and any owls (Sawhet and Great-horned seen earlier this week). Some saw a Cooper’s and a Red-tailed Hawk, and a Belted Kingfisher. We saw lots of the common little birds, Sparrows (Golden-crowned, Fox, Song), Spotted Towhees, etc. Richmond Brian recorded 52 species on our new DNCB eBird list. We got back to the entrance approaching Noon, and six of us decided to go to Speed’s Pub in Ladner for lunch. Only one pint of 1516 beer, but it was delicious with my regular Special, two pieces of Cod and Chips. Another awesome DNCB outing. The fourteen were: our Organizers Terry & Roger, Guru Anne, photogs Ladner Jack, Glen B & Richmond Brian with newbie Gary H, lunch specialist Mike B, White Rock Colin with graduating newbie Warren, North Delta Jean, new DNCBers Ladner Bryan & Masae, and me. This was our last official DNCB outing until Tuesday, January 8, when our destination will be White Rock Pier and Blackie Spit. Meanwhile, there are a number of Christmas Bird Counts (CBC) open for participation, including the Ladner CBC this Saturday, December 22 (Nats are meeting at Petra’s at 7:30 am), the White Rock/Surrey CBC on Saturday, December 29 (I am meeting at small car park beside King George Highway just west of the Highway 99 (Exit 10) at 8 am). Contact me if you’re interested in participating. Also, our first 2019 Delta Nats meeting is Wednesday (not Tuesday), January 2, at 7:30 pm at the Benediction Lutheran Church in Tsawwassen. Our own Nat, Paul Rennie, will be presenting on his adventures in the Galapagos Islands and the Peruvian Amazon. All welcome. For more info, reports and photos, check out our website. I’m Baaaaack! 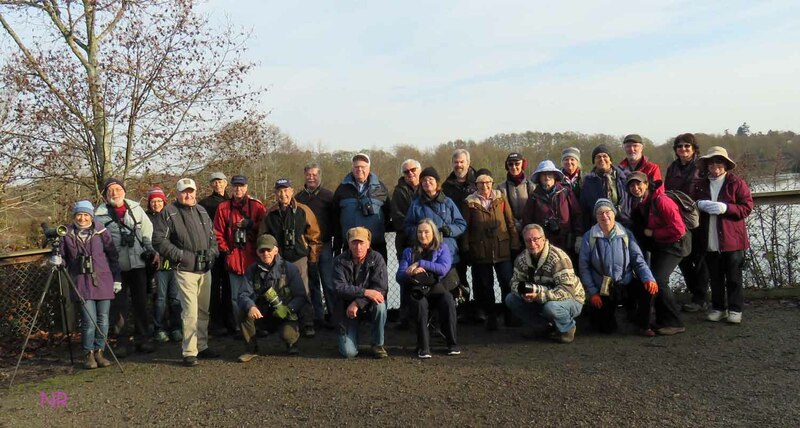 About 30 participants, including ten Newbies, enjoyed a sunny Wednesday morning walk on our quarterly Birds on the Bay (BOTB) outing in Boundary Bay Regional Park (BBRP). Lots of neat sightings and, of course inane chatter. Check out the brilliant photo evidence on our DNCB Flickr site. As we gathered at 9:00 am behind historic Cammidge House (CH) for the preliminary introductions, a Cooper’s Hawk posed in a tree overlooking us. A nice start. Terry tried in vain to take one of several Group photos here. We wandered along the road toward the Park pond, scaring up a few Mallards in the slough. A few Bald Eagles, mature and juvenile, were roosting in the tall Park trees. The pond was full, but only with Mallards and a few American Wigeons, but both Brewer’s and Red-winged Blackbirds around it gave us a bit of excitement. At the beach, the tide was very high with no feeding shoreline available, so no Shorebirds. Tonnes of waterfowl in the Bay; we got good Scope looks at Horned Grebes and Red-breasted Mergansers, and further out were large rafts of Scoters, Surf and White-winged, and American Wigeon with the occasional Eurasian among them. Further along we saw a pair of Common Goldeneye, and Marti spotted a Barrow’s. Marion & Marti had also spotted a small flock of Trumpeter Swans flying over as they drove in to CH. We took the inland trail past the Concession Stand in search of little birds. An Anna’s Hummingbird checked in, and some saw several Sparrow species, Fox, Golden- and White-crowned, Spotted Towhees. Perhaps the Bird of the Day was the Harris’s Sparrow among the House and Purple Finches. David & Noreen had seen a pair there earlier in the week, and we saw them a couple of times on this morning’s walk. Jack took the traditional Group Photo at the Lookout. We had met 30 plus Metro Vancouver Parks staff on their morning “workout” and they told us of a Peregrine Falcon capturing a Dunlin. Just past the Lookout, the Falcon posed in a tree right beside the trail. Brilliant! Continuing along toward the Pump House, the hordes of waterfowl were closer to shore; mostly Northern Pintail and a couple of Green-winged Teal and Gadwall. Then a few large flocks of Brant Geese cruised in. We searched in vain among the Gulls (mostly Glaucous-winged with some Mew and Ring-billed) on the spit for shorebirds. We saw a couple of small flocks of Sanderling go by, and then a huge swirl of Dunlin weaving back and forth along gave a few of us a nice thrill. At the 12th Avenue Lookout, Anne found two resting Yellowlegs (Greater?) in the grass. We continued back to CH on the inland trail, showing our Tree Swallow and Barn Owl boxes to the newbies. No spectacular sightings, but did see a Northern Harrier, Northern Flicker, Robin, photogenic Great Blue Herons, more Sparrows including the Harris’s. Someone finally found a Marsh Wren. We got back to CH spot on 11:30 am, just as the predicted rain clouds began to move in. Delta Nats Ladies Jennifer and Elizabeth met us with their array of scrumptious home-made scones and cookies (Rochelle was there earlier to set up, and Margaretha brought some goodies too). Of course, as expected, the horde of starving birders wolfed down these delectables with their normal frenzy. The 29 participants I recall included: ten Newbies Warren, Bryan & Masae, Don, Gillian & Jim, Betty & Steve, Una & Jack, and regular DNCBers Anne, Roger, Terry, Jim, Jack, Marion, Marti, Colin, David & Noreen, Mike B2, Margaretha, Gabriele, Gerhard, Richard H, Nats Rochelle, Elizabeth, Jennifer and me. It was a very enjoyable return to the DNCB fold for me, although the beautiful warm, sunny weather of Western Australia was tough to leave. Next Tuesday, December 18, we will meet at and leave from Petra’s at 7:30 am for Burnaby Mountain, expecting to meet others at the Horizon’s Restaurant around 8:30 am. 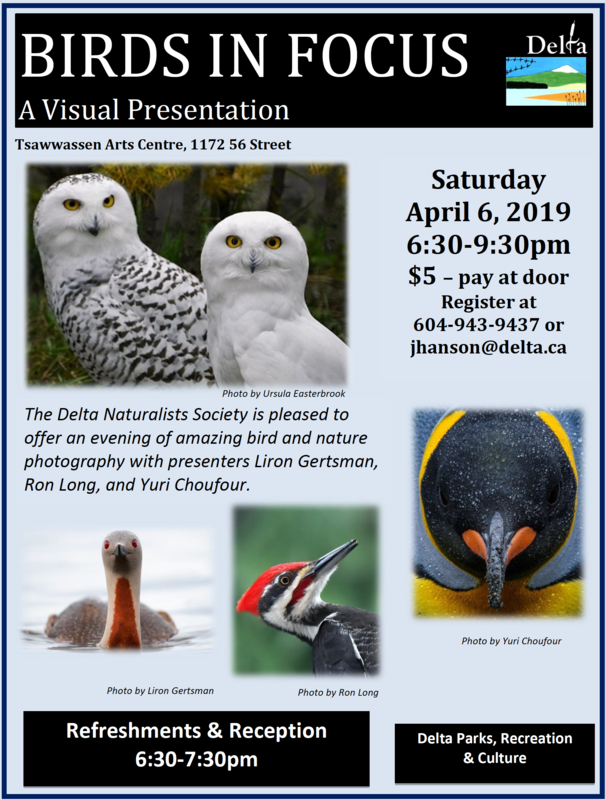 Terry Carr and I have agreed (mostly Terry) to coordinate our Tsawwassen section of the Ladner Christmas Bird Count on Saturday, December 22. We’ll meet at Petra’s at 7:30 am and arrange Count groups in the area; all welcome to participate. You do not need to be an expert birder. Spotters and recorders are needed, too. For more info on outing reports and destinations, photos, and other good Delta Nats stuff, check out our website. Roger and Jean’s excellent DNCB outing reports since September while I was away are well worth perusing. A large group of keen Delta Nats birders gathered on a frosty morning in the Terra Nova parking lot. Despite the chilly morning, it was beautifully sunny, perfect for finding birds, and good for the photographers among us. Their great photos are much appreciated. I arrived a bit late only to see the group disappearing into the woods. Birders tend to dawdle now and then so I was soon able to catch up with them. They had a list of birds for the blog that had already been spotted – Northern Pintails, Mallards, and American Wigeon. Also found was a number of Horned Grebe, Red-breasted Merganser, Eurasian Wigeon, Green-winged Teal and Bufflehead. As we walked on the path Into the trees several sparrow species were observed – Song, Fox (Sooty) and Golden-crowned. The trees here were quite alive with birds such as American Goldfinch, Dark-eyed Junco (Oregon), Black-capped Chickadees and Spotted Towhees. Also flying about were several Downy Woodpeckers that were first heard and then located in the higher parts of the trees. Brian Avent, our leader then took us along a path into parts of the park that most of us (make that me) had never been on before. It proved to be very good habitat with water on one side and trees on the other. In this general area were even more good sightings: Northern Flicker, Pacific Wren, Golden-crowned and Ruby-crowned Kinglets as well as our usual regulars, House Finch and quite a number of American Robins. Several Bald Eagles, both adults and juveniles, were seen throughout the park perched high in the trees. A number of other raptors were spotted, many at a distance, partly obscured and somewhat tricky to identify. A short discussion followed over two of these hawks, and the eventual identification for both was that they were Red-tailed Hawks. Since Brian had located a Northern Goshawk in this location the previous day, we had hoped to find it again. This prompted the particularly careful scrutiny of any hawk perched in a tree, no matter how far away. The Merlin and the two Northern Harrier were more closely seen and so easily identified. A particular delight for the group was the sudden flight into the sun of a beautiful pale Barn Owl. In those few seconds David, Terry and Brian managed to snap several good photos of the owl, which for many was the bird of the day. We also walked along the edge of the marsh where hundreds of Dunlin could be seen feeding along the shore. Also seen was a Marsh Wren, Great Blue Heron and Double-crested Cormorant. Several times during the morning flocks of Snow Geese were heard honking and observed as they flew overhead. By the time we arrived back at the parking lot, we had seen a few other species that are often found here: Northwestern Crows and Rock Pigeons. A number of the group stayed a bit longer and were rewarded with finding several Hooded Mergansers and the elusive Wilson’s Snipe. Certainly not a species that can be easily found. It would prove to be a second bird of the day for those who had stayed later. Our group this morning included: Johnny Mac, Marion, Marti, Lidia, Roger 1, Roger 2, Terry, Gabriele, Mike 1, Marguerite, Noreen, David, Glen, Mike 2, Jack, Pat, Maureen, Brian our excellent leader, and me (Jean). Quite a good day out birding as usual and as always interesting and fun. A thank you goes out to Brian for leading the trip. Next week, on Wednesday 12 December, is our quarterly Birds on the Bay outing. We will meet at and leave historic Cammidge House at 9:00 am on our 2 ½ hour walk in Boundary Bay Regional Park, returning to CH at 11:30 am for the famous Delta Nats Ladies’ Goodies (see Rochelle’s poster below). With any luck, we will have our leader Tom Bearss back from his adventures (walkabout?) in Australia! With the preceding few days of heavy rain and more forecast, we were expecting more of the same for our regular Tuesday outing. Fortunately, the five members showing up at our Peach Arch Park meeting spot were rewarded with one of the most beautiful, sunny, days yet! Mike, David, Terry, Jack and myself (Roger) passed through the US Customs with no wait, and turned down the road to the pier in Blaine. It should be mentioned that there was a very high tide today leaving very little shoreline exposed. Our first stop at the base of the jetty yielded a raft of Mallards, and a few Canada Geese in the distance, and little else. Parking at the lot at the end, we walked to the observation deck looking across to the Semiahmoo Spit, and found the following birds on the water: several Common Loons, Horned, Red-necked and Western Grebes, Surf and White-winged Scoters, Common Goldeneyes, Pelagic and Double-crested Cormorants, and some Red-breasted Mergansers. Far out on the water, some Long-tailed Ducks and a cluster of Brant could be barely made out. Returning to the van, we drove to the marina gate and went down to the floating docks where we saw only another Common Goldeneye and one Horned Grebe! On the rock breakwater I took a photo of a gull that turned out to be a California when I processed it on the computer. As we were leaving, we were joined by the late riser Brian bringing our trip total up to six. Did I mention that it was a beautiful sunny day? …you lazy sleep-ins! Leaving the pier at Blaine, we headed to Semiahmoo Spit, which I calculated to be a long par 5 distance away (maybe a par 6 for Tom), a twenty minute drive around Drayton Harbor (ok… that’s the last time I spell harbor this way, even though my spell-check is trying to make me do so)! Our first stop on the way was at Dakota Creek Park where the creek meets Drayton Harbour. There is a bird feeder at the side of the house beside the trail down to the water, and there were Juncos, Black-capped Chickadees, and Towhee enjoying it. There was nothing to see on the water itself. We then circled around the base of the harbour, and, due to the lack of birds because of the high tide, continued to the base of the Semiahmoo Spit where we parked. The only Belted Kingfishers we saw were along this south road. On the Boundary Bay facing side of the spit, we had large numbers of Surf Scoters, some Buffleheads, Red-breasted Mergansers, distant Long-tailed ducks, and more Common Loons. Crossing the road to the east, we found more Scoters, but predominantly White-winged (something we noticed in previous trips). Also, we found the first Ruddy Duck. We had hoped to encounter Canvasbacks, but came up empty. It’s possible there were some there, but the angle of the sun made it difficult to scan out to the middle of the harbour where we usually see them. Most of the action here was along the shore line where the high tide probably worked to our advantage forcing the Black Turnstones and Sanderlings right up to the road where we had amazing looks at them. They didn’t seem concerned with pedestrians passing by on the sidewalk, and our photos should be spectacular. Walking along the beach, we encountered a number of Golden-crowned Sparrows. Just before the marina, there are linked floats that extend several hundred meters out into the harbour. Near the shore, the first float had a resting Black Oystercatcher and a Whimbrel with its head tucked in. It wasn’t until it uncurled it’s head and the shorter curved beak and striped head could be seen that it could be distinguished from a long-billed Curlew. I’d say this bird was probably the sighting of the day! At the farthest end of the line of floats there were dozens of sleeping Harbour Seals and Double-crested Cormorants! Walking around the top of the spit, we turned into Boundary Bay proper and finally had some close-up views of the Long-tailed Ducks, male and female. Also, there were some Red-throated Loons but no Pacifics like we had on the previous outing here where we had dozens of both species. On the pier looking across to the white-painted, white rock of White Rock (wasn’t painted when I was a kid!) we had a passer-by take our obligatory group photo, and then went inside the resort to have our lunch (coincidentally, it was exactly 12:00 noon, and the restaurant had just opened… perfect timing). While eating, we were able to see most of the birds we had seen earlier pass below us outside our picture window. If it had rained, we could have birded from the restaurant! 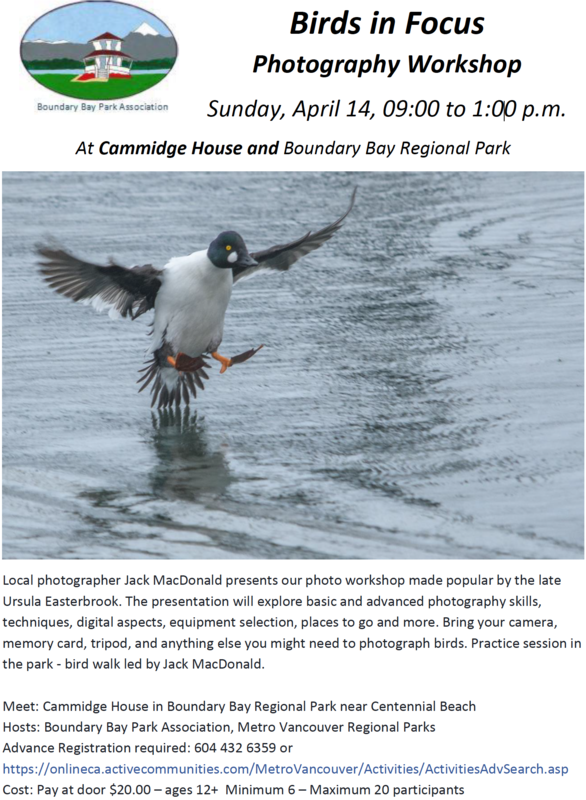 We had a great time today, and lucked out with the weather and lots of great birds… check out the group’s photos to see what you wimps lost out on by staying in bed! Because of the Semiahmoo Spit, Drayton Harbour is like a bay-within-a bay, and I keep referring to my Anne Murray’s “Nature Guide to Boundary Bay” that lists all of the sources of water that drain into the Bay. We all know of the Nicomekl, Serpentine and Little Campbell, but the Dakota and California rivers are important sources, of which most of us have probably never heard (check the “Publications” listed on the right side of our blog). Next week, Tues. Dec. 4, DNCB will visit Terra Nova Park, Richmond; leave Petra’s at 7:30 am, meet at west end of River Road ~ 8:15 am. Not too much from Tom this week, but he seems to be having too much fun! Only 15 days left, Tom… make the best of it! With a beautiful morning to look forward to, the Petra’s group departed for the Tsawwassen Ferry Jetty, where we met those who had gone directly there. Parking at the pull-out near the terminal, we scanned the compensation lagoon and tried to identify the large number of birds on the water and shoreline. On the north side of the jetty birds seen included a small group of Black Turnstones and Black Oystercatchers feeding on the shore rocks. On the water there was a Common Loon failing to swallow a flatfish after working at it for several minutes. Also, there were large flocks of Pintail, American Wigeon, Gadwall, Mallards, Surf and White-winged Scoters, scattered Buffleheads, and Horned Grebes. Several Double-crested Cormorants were diving. Looking farther off shore we saw recently arrived Brants and some Western Grebes. On the south side of the jetty we were looking into the rising sun which made it difficult to see clearly but there were many more Black Oystercatchers, and Black Turnstones as well as a small group of Harlequin and Surf and White-winged Scoters. The only raptors included a few Bald Eagles on lamp posts, and what might have been a juvenile Peregrine Falcon. Driving through the TFN lands, there were very few birds seen. A small number of Green-winged Teals were in the Kingfisher Slough, and a Red-tailed Hawk in a distant tree. The pond at the end of the TFN road had only a few Green-winged Teal, and there was a dark raptor that we thought was a very dark Red-tailed. On the dyke just west of the Westham Island bridge, we scanned the river but saw only a small (unidentified) flock of gulls and didn’t see the Mute Swans until we were on the bridge! In a field just before the Reifel gates there was a small flock of Snow Geese but we didn’t encounter the really large numbers seen in the last week. Arriving at the Reifel Bird Sanctuary, we met the remainder of our birders including our “guru” Anne Murray bringing our total to 26! Once again, with such large numbers, it was impossible to collate what everyone had seen, as we got so spread out over the trails… so for exact numbers, see Brians e-Bird report! Heading past the gift shop we made our first stop to look at the three wintering Black-crowned Night-herons. All along this beginning stretch Black-capped Chickadees, Song, House, White-crowned, Golden-crowned, and Fox Sparrows were waiting to be fed. At one point three Sandhill Cranes flew overhead heading to the fields to the north. We initially thought the three were the resident cranes, but when we got to the fields adjacent to the east trail, we saw the three plus five others for a total of eight… the high-light of the day. *(See the interesting Sandhill Crane aside at the end of this Report). Half-way along the east trail, Marion spotted a Red-breasted Nuthatch. I had hoped to see a Brown Creeper, but it was not to be. All along the east trail we kept our eyes open for owls but, again, none to be seen. Turning south, we walked the west trial where we encountered more of the same birds wanting to be fed. Arriving at the tower, the more energetic of us climbed to the top to scope the ponds and outer shore line. In the distance we could make out small clusters of Trumpeter Swans, Canada Geese, and large flocks of ducks. A few Northern Harriers were cruising the marsh, but no Short-eared Owls – strange, as just across the river there are so many at Brunswick Point! Along the short trail to the tower we encountered a flock of Bushtits. From the tower, we split into two groups, with a few heading south-east on the inner trail, while the rest of us spread out along the outer path along the marsh. In the west-field marsh the ducks were mostly Northern Shovelers, Pintail, with some American Wigeon, Mallards, with a few Gadwall thrown in. On the outside of the dyke path we had a Marsh Wren. Farther south, the east end of the west field had a large number of Dowitcher species (probably Long-billed). Also at this spot, we saw a Northern Shrike sitting at the top of a tree at the west end of the pond! The south-west marsh had the largest number of species, with American Coots, Ring-necked Ducks, the persistent Trumpeter Swan, more Shovelers, Buffleheads, Mallards, three Pied-billed Grebes, etc. The highlight for some of us was hand feeding the Swan without losing any fingers. Kathleen, the refuge manager, told me a few days ago that there was some concern that the swan might, accidentally, be able to pull a small child into the water while being fed? So far, we’ve had no explanation as to why the swan had not left the reserve for the summer with the rest of them? Finishing the South-west Marsh loop, a few of us back-tracked to the raised viewing platform on the west side of the marsh where we saw more of the same ducks and fed some more chickadees. Also, Terry managed a photo of a Golden-crowned Kinglet on the side of the trail. In front of the Fuller-slough Lookout, some visitors were feeding the Wood Ducks which were tame enough to sit on their hands. Also, the Sandhill Crane was there on its own, and was keeping back from the hand-feeding. Arriving back at the entrance at noon, we decided to call it a day with the only addition being a Northern Harrier in a roadside tree on the way home. Next Tuesday, November 27, we will visit Blaine & Semiahmoo Spit; leave Petra’s at 7:30 am; carpool from Peace Arch parking lot 8 am, and meet at Harbor Rd 8:15 am. Just after dawn on a chilly morning, 19 Delta Nat’s birders arrived at Boundary Bay and 104 St. All of us had found our warm mitts and taken extra jackets so we were snug and warm as we headed east from 104 St.
Our first good sighting of the day was found by Roger 1, who spotted a Blue Goose in a very large flock of Snow Geese. Several Bald Eagles were hunting on the edges of the field where they were grazing. Of course, this caused the flock to take flight several times giving everyone great views of these beautiful geese. On the bay side of the dike we could see hundreds of ducks, mostly Pintails and thousands of Dunlin. The huge Dunlin flocks once again displayed their amazing ability of both graceful and perfectly coordinated flight. Mixed in with the Dunlin flocks were small numbers of Black-bellied Plovers. Besides the eagles, a Merlin, a Peregrine and a Northern Harrier were also seen. Several people also reported seeing a Wilson’s Snipe and a Northern Shrike. As we headed west, the rising tide quickly reached the dike driving the shorebirds to seek whatever bit of land they could find along the shoreline. Quite a number of birds were spotted as we scattered along the dike. They included a Fox Sparrow, some White-crowned Sparrows, a Western Meadowlark, Black-capped Chickadees and several Golden-crowned Kinglets. Probably the most prized sighting was the Palm Warbler that most of us were able to see flitting about among the bushes. A small flock of Canada Geese landed in the farm field where several Great Blue Herons were stalking prey. We also observed the usual birds we can find here, such as Northern Flickers, American Robins and House Finch. We then headed to 72 St where a Long-eared Owl had been reported. It is always a delight to see these beautiful owls tucked away inside the bushes. Glen photographed a bird which he later identified (and Anne confirmed) as a Swamp Sparrow. 64 St. On our way, we were able to get a great view of a Rough-legged Hawk as it hovered over the marsh. In the ponds, we found a Pied-billed Grebe, Eurasian Wigeon, several Gadwalls and quite a number of American Wigeon. We managed to catch good views of several brilliant plumaged Yellow-rumped Warblers, both Myrtle and Audubon, as they hopped about in the trees. We managed a few quick looks at a lovely bright yellow Wilson’s Warbler as well a Spotted Towhee and a Marsh Wren. There was also a Ring-necked Pheasant that was observed close the parking area. The group included: Glen, Patrick, Roger 1, Pat, Chris, Roger 2, Mike 1 & 2, Margaretha, Lidia, Gabriele, Terry, Brian, David, Johnny, Noreen, Richard and myself (Jean). Apologies to anyone I missed, it only proves that my memory is not as good as Tom’s or Roger’s. Our morning was particularly birdy, and, as always, congenial and enjoyable. Next Tuesday, November 20 we will leave Petra’s at 7:30 am for an outing to Reifel Bird Sanctuary, via Tsawwassen Ferry Terminal & TFN lands. Meet at Reifel parking lot at opening time 9 am.